Carol McCullough (b. 1941) and her husband Fred joined the National Organization for Women (NOW) in 1971, but belonged to different chapters in the Pittsburgh area so they could alternate childcare when one or the other attended meetings. Men were always welcomed in NOW locally because there was a sense the movement was changing men’s as well as women’s roles. She said the women’s movement “WAS my life for quite a few years,” and it was a feminist family as the children went to many meetings and marches (McCullough, 2009). Ms. McCullough participated in a consciousness raising group and found it very helpful in learning to make the case for a particular point of view on an issue. 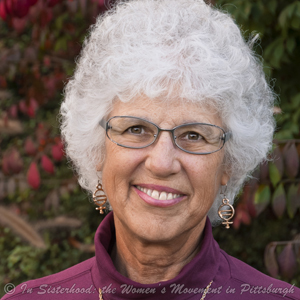 She was active in and elected to office in the South Hills NOW chapter, the Squirrel Hill NOW chapter, the Southwest Pennsylvania Council of NOW Chapters and Pennsylvania NOW. At every level, they used multiple tactics to gather political and financial support for issues; tactics included letter writing campaigns, phone banking, walk-a-thons, marches and lobbying elected officials. Locally, Ms. McCullough was involved in monitoring the implementation of Title IX in Pittsburgh Public Schools, especially as it related to opportunities for girls in sports and vocational education. In addition to serving as an officer, she maintained the Southwest Council of NOW chapters telephone answering machine for 30 years, providing information about chapter meetings, programs and timely issues. Passage of the Equal Rights Amendment (ERA) was the major issue in NOW for ten years. Ms. McCullough attended many rallies and marches, and rode the NOW bus to Washington, D.C. every Tuesday for months in 1978 to lobby legislators during the campaign to extent the deadline for ratification. She was also on the buses to Springfield, Illinois to lobby legislators there to pass the ERA and move it closer to ratification. Ms. McCullough and other members were in tune with everything going on in NOW at all levels. She said “we were a powerhouse when we would go to the conventions … it was just a very exciting experience” (McCullough, 2009).